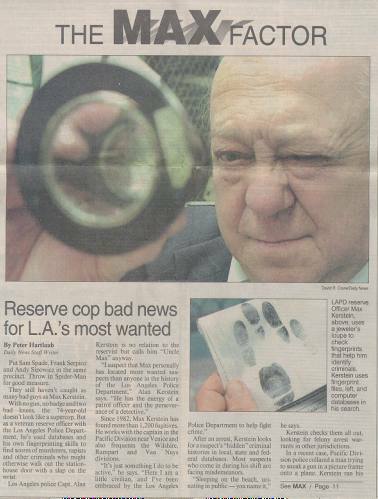 IDENTIFICATION SPECIALIST RESERVE POLICE OFFICER WITH LOS ANGELES POLICE DEPARTMENT SINCE 1985 IDENTIFYING IN-CUSTODY ARRESTEES WANTED FOR OTHER MAJOR CRIMES, WANTS AND WARRANTS. During past 15 years through his techniques in identifying wanted persons through computer checks, aka’s, dob’s, physical oddities, fingerprints and other forms of identification Kerstein has identified more than 3,500 in-custody arrestees who were in jail at the time for other major crimes. He has also identified thousands of secondary felony and misdemeanor warrants totaling more than $20,000,000. Kerstein has organized and hosted through his newspaper an annual Southern California chain store seminar featuring major chain store buyers as guest speakers from 1968 to 1983. He is also a proven research specialist, creating an annual distilled spirits market analysis for industry from 1970 to 1985, in addition to annual post holiday surveys of holiday spirits sales. Kerstein’s specialty is visiting various divisions of the Los Angeles Police Department and auditing the in-custody criminal histories after their records have been initially checked. Through this effort he has not only identified persons who were wanted, including parolees and prison escapees, but he has also counseled the officers and record clerks on how they can be more proficient in their initial criminal history checks. He is a highly respected by the LAPD as criminal computer expert and has found millions of dollars in lost revenues for the LAPD. Over the years Kerstein has been honored numerous times by the Los Angeles Police Department, City of Los Angeles, Attorney General's Office, the community, and even the President of the United States. He has received considerable press coverage for his work including a special on the Today TV Show for his accomplishments and numerous commendations. Kerstein is available, upon invitation, to work as an outside consultant to any police agency since he is a reserve officer with the LAPD and not a paid employee. He would contract with the agency for a specific period of time to perform a specific task or tasks at a pre-agreed upon flat fee in addition to travel, hotel, transportation and a fixed per diem fee for meals and other expenses. He is also available to talk at meetings, seminars, workshops and conventions on the subject of due diligence, taking criminals off the streets and reducing crime, victims and costs to both the community and the individual victims. Kerstein can serve as a Master Of Ceremonies at special functions and has a great sense of humor for those who need a good laugh. There is no charge for the initial consultation by phone or in person.